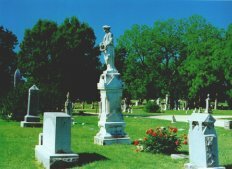 Pecan Grove Memorial Park is one of the oldest cemeteries in North Texas. Located in McKinney, the county seat of Collin County, and 20 miles north of Dallas, Pecan Grove is the final resting place for many early Texas pioneers, from Governors to gunslingers. Heroes of the Texas Revolution are interred here, as are veterans of the Mexican War, the War for Southern Independence, and every war thereafter. Although it was formally incorporated in 1870, the earliest grave dates from 1854. The property, consisting of 57 acres, was granted to Samuel McFarland by the Republic of Texas in 1845. It is a rustic and peaceful setting, largely undisturbed by the progress around it. In 1996, members of the William H. L. Wells Camp, Sons of Confederate Veterans, in nearby Plano, began the process of identifying and marking the graves of the many Confederate veterans buried there. Guided by the research of Mrs. Margaret West Hughston, and with the help of the resources of the Dallas Public Library Genealogy Department, the members of the Camp were able to document sufficiently 125 of the approximately 200 Confederate veterans, and mark their graves. Each grave was marked with a bronze plaque, 12" X 24", set into 160 lbs of concrete. Over the course of two years, members of the Camp poured 8.5 tons of concrete at Pecan Grove. There is no information available other than that listed on these pages. General queries will not be answered.